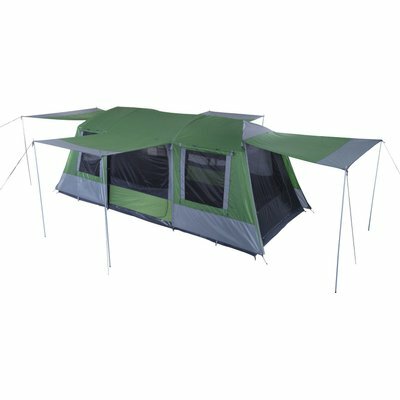 Design: A large 3 room tent that combines the light weight and easy setup of a dome tent with the dimensions and form of a cabin tent. The flexible layout means the 3 rooms can be used as bedrooms, living or screen rooms. Using a light blocking, dark coloured inner, the NiteRoom technology reduces the ambient light to allow for a longer, more restful sleep. Easy to set up design with walls that are close to vertical thanks to the Portico™ pole system. 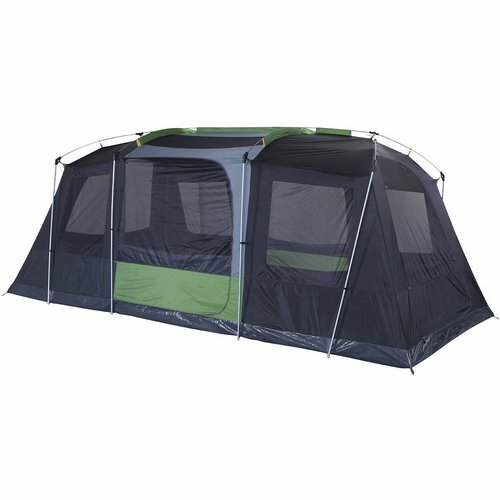 Large front, side and rear awnings open out for extra protection & cover. Fly: 100% polyester 150 Denier ripstop fabric, enhanced UVTex® 2000 Sun Tough Fly fabric - the UVtex® treatment not only protects the fly from harsh UV rays, it also doubles as a 100% waterproof barrier. 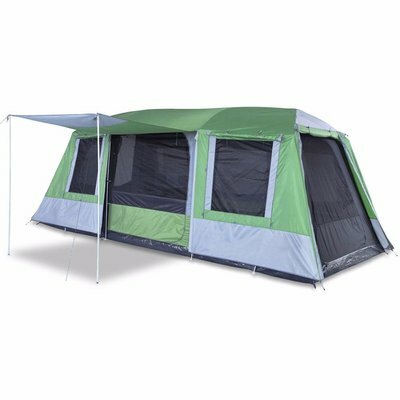 Factory heat taped seams keep the tent waterproof by preventing seam leakage. Posi-Brace™ securely fastens your fly to the tent with these Velcro® attachment points. FlowAway™ tension strap system eliminates the ponding of water in awnings. 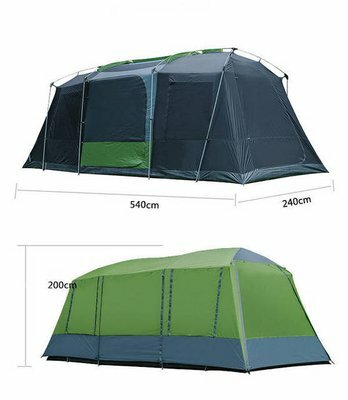 Inner Tent: Polyester inner tent with No-See-Um mesh windows for ventilation but no biting insects. Using a light blocking, dark coloured inner, the NiteRoom technology reduces the ambient light to allow for a longer, more restful sleep. Floor: Heavy Duty 14x14 PE Floor - Incorporating a bucket style floor with elevated seams keeping the moisture out but more importantly, you dry. Door: Easy Step D Doors, Oversize D-shaped doors for easy access to the interior with lower sills to minimise tripping. Pole System: Duraplus Fibreglass poles with stainless steel joiners for maximum durability. 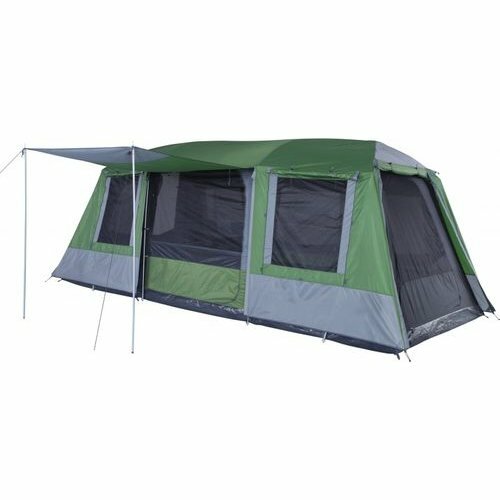 Portico™ Poles - Steel poles that create near vertical walls, high ceilings and increase the strength of the tent. 2 Awning poles provided. Environmental Control: Large mesh walls create a fully ventilated environment. Large windows in the outer tent allow you to control your climate. DryGuard™ Plus protects windows from wind driven rain with storm flaps that Velcro together. 12V Ready: 1 centrally located light attachment loop & 1 lantern hook. Power cord access zip. Velcro Power Cord holders.